From the age of five, children who pass the primary school admission tests and the interview from the nursery section are received into the Nkisi Primary School. They are groomed for five or six years for the Anambra State, Federal and Nkisi Comprehensive Secondary Schools Common Entrance Examinations. 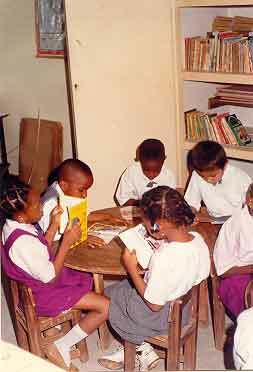 The classes are grouped and graded in years and according to the intellectual and moral performances of the children under the direct care and guidance of class teachers, form teachers, supervisors and the headmistress. Class sizes are deliberately kept small to ensure a great deal of individual attention so that every pupil has the opportunity to reach his or her potentials through the caring and structured program. Learning support is available to any pupils requiring special help. Special programs may be developed in certain cases. Thus our children benefit from the individual attention provided by the highly trained and qualified staff. The Language of instruction is English. Igbo and French are taught like all the Sciences and the Arts. This section is specially and completely under the direction and guidance of the Creative Minds Foundation Principal.